HENDERSON, Nev. (JTA) – Come November, Nevadans in this suburban Las Vegas district may well elect to Congress Jacky Rosen, a software developer and president of her synagogue. But Jesse Sbaih isn’t blaming Rosen. 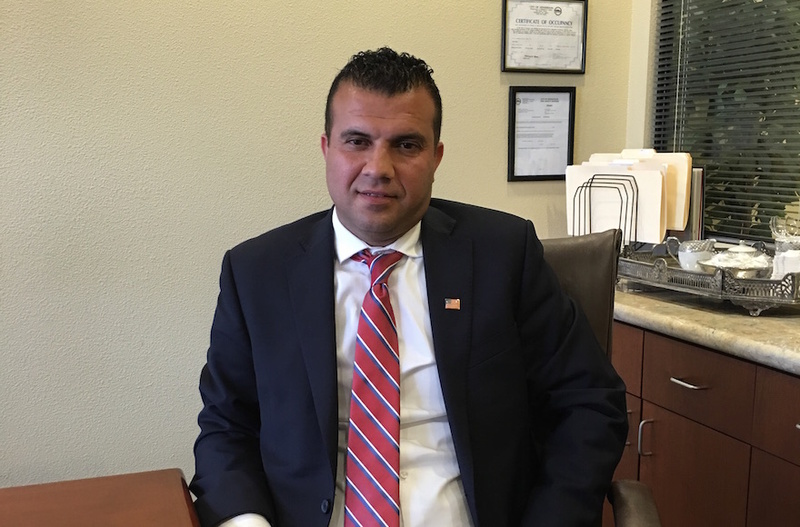 Rather he is blitzing the Nevada media with his claim that Sen. Harry Reid, D-Nev., the Democratic boss in the state, counted him out of the race in Nevada’s 3rd Congressional District because he is a Muslim. Sbaih was more than happy to present his argument to JTA, and at no point suggested that Rosen – who was ultimately Reid’s pick in the bid to replace Joe Heck, a Republican whose run for Senate leaves his seat open – was selected because she is Jewish. Instead, he said, Reid was simply seeking someone who was not Jesse Sbaih. Sbaih remains in the running for the June 14 congressional primary, but Reid’s full-throttled power is behind Rosen. Reid is retiring this year and wants to leave his mark on the state. Heck’s open seat is an opportunity – President Barack Obama won the district in 2008 and 2012, albeit by relatively small margins. Reid’s Searchlight Leadership Fund political action committee is backing Rosen. She also has the backing of a political action committee associated with Rep. Steny Hoyer, D-Md., the powerful minority whip in the U.S. House of Representatives, and Emily’s List, which backs pro-choice Democratic women. Did Reid bring up Sbaih’s faith? It comes down to he said/she said – quite literally. Sbaih showed JTA a series of texts he sent to Lambe after his Aug. 25 meeting with Reid, in which he candidly discusses whether he should suspend his campaign because of his “ethnicity/religion.” Lambe did not immediately cut him off – she refers to a possible federal appointment that Reid’s team discussed with Sbaih – so she does not appear to be put off or surprised by his reference to his religion or its political implications. However, Sbaih’s references to his faith in the texts could refer to his earlier conversation with Lambe and not to the conversation with Reid. It is also not clear from the texts if she straight out said being Muslim would be a problem, or if he simply inferred that from her saying that he should anticipate attacks because of his religion — which she acknowledges. What’s also not explained is why Democrats would fear running an Arab American or a Muslim for office. Multiple Arab Americans from both parties have served or are serving in Congress, and there are two Muslim Democrats from the Midwest — Sbaih would be the first member to be both Arab American and Muslim. Where Sbaih has ammunition, however, is in the claim by Reid’s team that the senator simply wanted Sbaih, 40, to gain seasoning – through the statehouse or federal government work – before running. She told the crowd she was fighting for “the freedom to be your authentic self, go to the bathroom wherever you choose, thank you very much — you can be Jack or Jacky Rosen,” she said, nodding at the label and earning appreciative laughter.